Dear colleagues, dear conference committee members. We have decided in cooperation with university departments to found new scientific GRANT journal to fulfill our goal of academic and scientific conferences full support. The aim of our journal is to popularize and transfer any research and developments results. The GRANT journal with own ISSN follows all parameters of compulsory publicity of conference events and the journal should help the conferences to attract more participants in next volumes. information about university and its departments networking. The journal has no field of knowledge limitation, but some regulations and expertness must be followed. The journal is able to publish texts in English. 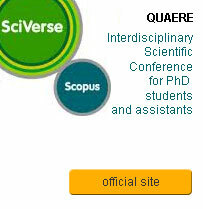 We are open for your texts publishing and even for cooperation in journal coordination in editorial teams etc. that is open for natural persons and departments also (faculties, universities etc.). If any further question, do not hesitate to contact us. Inform others about your academic event!